Let's talk about the UI layer, the implementations and the factory that powers it all. For everyone who does not know, JVx allows you to write code once and run it on different GUI frameworks, without changing your code. This is achieved by hiding the concrete GUI implementations behind our own classes, the UI classes, and providing "bindings" for different GUI frameworks behind the scenes. Such a "Single Sourcing" approach has many advantages, and just one of them is that migrating to a new GUI framework requires only the change of a single line, the one which controls which factory is created. The Factory Pattern is an important pattern in Object-Oriented-Programming, it empowers us to delegate the creation of Objects to another Object which must not be known at design and/or compile time. That allows us to use Objects which have not been created by us but merely "provided" to us by an, for us unknown, implementation. 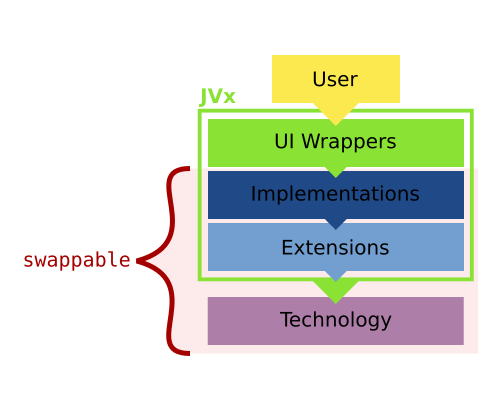 JVx is separated into different layers, with the UI layer being at the top and of the most concern to users. Obviously, the first one in the chain is the so called "technology" layer. It represents the UI technology, for example Swing, JavaFX or Vaadin, which is used to power the JVx application. 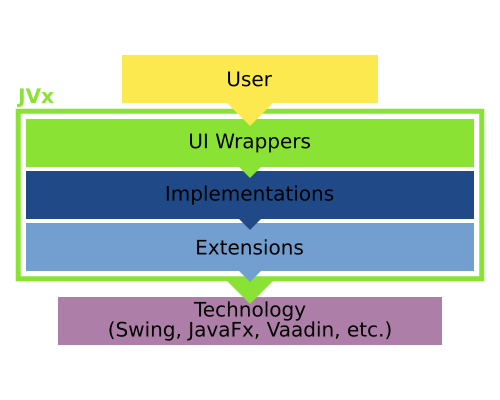 Next comes the extension layer, components from the technology are extended to support needed features of JVx. This includes creating bindings for the databook, additional style options and changing of behavior if necessary. From time to time this also includes creating components from scratch if the provided ones do not meet the needs or there simply are none with the required functionality. For the most part, we do our best that these layers can be used without JVx, meaning that they represent a solitary extension to the technology. A very good example is our JavaFX implementation, which compiles into two separate jars, the first being the complete JVx/JavaFX stack, the second being stand-alone JavaFX extensions which can be used in any application and without JVx. Theoretically one can skip this layer and directly jump to the Implementation layer, but so far it has proven necessary (for cleanliness of the code and object structure and sanity reasons) to create a separate extension layer. After that comes the implementation layer. The extended components are extended to implement JVx interfaces. This is some sort of "glue" layer, it binds the technology or extended components against the interfaces which are provided by JVx. This is achieved because the UI layer is not extending the Implementation layer, but wrapping instances provided by the factory. It is oblivious to what Technology is actually underneath it. Why is the UI layer necessary? It allows to add Technology independent features. Additionally this layer allows us to implement features which can be technology independent, our naming scheme, which we created during stress testing of an Vaadin application, is a very good example of that. The names of the components are derived in the UI layer without any knowledge of the underlying Technology or Implementation. Of course that is not even close to sophisticated, or a good example for that matter. But it shows that one can build new components out of already existing ones without having to deal with the Technology or Implementation at all, creating truly cross-technology controls. // At the start of the application. // Later inside the UI wrappers. It "just returns new objects" from the implementation layer. That's about it when it comes to the factory, it is as simple as that. Changing between them can be as easy as setting a different factory. I say "can", because that is only true for Swing, JavaFX and similar technologies, Vaadin, obviously, requires some more setup work. I mean, theoretically one could embed a complete application server and launch it when the factory for Vaadin is created, allowing the application to be basically stand-alone and be started as easily as a Swing application. That is possible. That is how JVx works in regards to the UI layer. It depends on "technology specific stacks" which can be swapped out and implemented for pretty much every GUI framework out there. We currently provide support for Swing, JavaFX and Vaadin, but we also had implementations for GWT and Qt. Additionally we do support a "headless" implementation which allows to use lightweight objects which might be serialized and send over the wire without much effort. Adding support for a new Technology is as straightforward as one can imagine, simply creating the Extensions/Implementations layers and implementing the factory for that Technology. Giving a complete manual would be out for scope for this post, but the most simple approach to adding a new stack to JVx is to start with stubbing out the IFactory and implementing IWindow. Once that one window shows up, it's just implementing one interface after another in a quite straightforward manner. And in the end, your application can switch to yet another GUI framework without the need to change your code. > This is achieved because the UI layer is not extending the Implementation layer, but wrapping instances provided by the factory. It is oblivious to what Technology is actually underneath it. What you describe here is a nice example of the Bridge Pattern . I have seen the Bridge Pattern for the first time about 30 years ago, when I started working with the ET++ framework  (the Framework Erich Gamma and André Weinand created in the 80ies and and a lot of the GOF  design patterns have been discovered in this framework). In ET++, the bridge was used for a very similar purpose: to hide the actual (system dependent) UI implementation from the abstraction used in the UI. They also used a factory to create the window system dependent components. This shows to me, that patterns like the BridgePattern are very fundamental, because even without naming it, you have implemented it. So, big thumbs up!